Why Indirect Manpower is not Included in the Efficiency Report? Why we only add direct manpower in the efficiency report? Can't we add a quality person, input man, line leader, line supervisor i.e. indirect manpower? … A question from an OCS reader. When you are talking about the efficiency report, it includes line efficiency and required information for calculating the line efficiency. Though you can keep a record of supporting manpower in the efficiency report without including their attended hours in efficiency calculation. Efficiency is calculated as Hours produced against Hours worked. Or total minutes produced against total minutes worked (attended minutes) by the direct employees. To get minutes produced from each employee, standard time need to be assigned to all jobs that are performed by manpower working in a line. But in practice, we can’t assign SAM for line supervisor's job and their job is not included in the style (operation bulletin). Therefore, we are not getting any produced hours from line supervisors and line leaders. That is the reason we don't include line supervisor, machine maintenance and line leaders in efficiency calculation. In case a quality person checks garment and you have assigned SAM for quality checking task, you need include quality checkers and their attended hours in efficiency calculation. If checking job is not included in the OB, their work should not be considered in efficiency calculation. 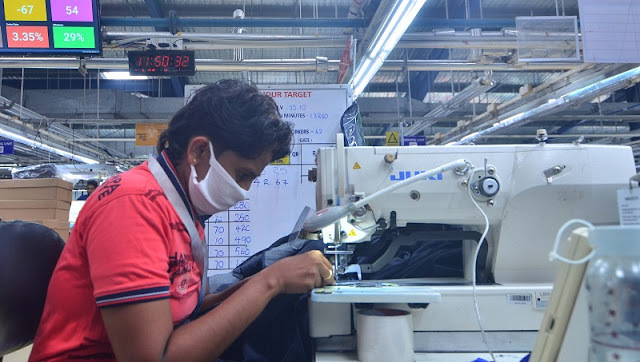 Direct manpower: Direct Manpower are those actually do the work and involved making the garment. Sewing operators, helpers, pressmen, quality checkers are direct manpower (labor). In garment costing their cost is considered as a direct cost. Indirect manpower: Indirect Manpower are those who do the supporting role to get the job done mostly those doing the supervision, line leader, administration, line feeders, industrial engineers etc. Similar Question: Should I include line helpers in efficiency calculation? Online Clothing Study: Why Indirect Manpower is not Included in the Efficiency Report? Direct and indirect manpower in manufacturing. Who should be part of efficiency report and who are not.